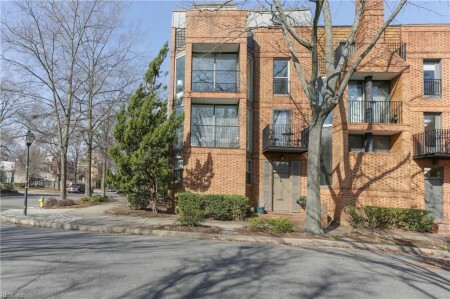 1 OF 4 MID-CENTURY STYLE TOWN HOMES DESIGNED BY RENOWNED ARCHITECT BARTON MYER. RENOVATED END UNIT WITH DRAMATIC OPEN LIVING CONCEPT WITH WALLS OF WINDOWS & LOTS OF LIGHT OVERLOOKING TREED PARK SETTING. BRAZILIAN WALNUT FLOORS. COOK'S KITCHEN WITH WOLF GAS RANGE, STAINLESS STEELE APPLIANCES, GRANITE COUNTER-TOPS. NEW MASTER BATH WITH WHITE SUBWAY TILE, LARGE WALK-IN SHOWER WITH 2 TANK-LESS WATER HEATERS FOR ZONE CONTROL. BALCONY ROOF AND SLIDERS 2016, NEW GAS FIREPLACE INSERT, NEW WASHER/DRYER 2018. 1ST FLOOR OFFICE WITH NEW CLOSET COULD BE 4TH BEDROOM. PRIVATE DECK WITH NEW FLOORING & MEMBRANE ROOF 2018. SOME ELECTRIC & PLUMBING UPDATES, NEWLY PAINTED INTERIOR. GENERATOR HOOKUP HAS SEPARATE CIRCUIT. CAN RUN ON CITY OR GENERATOR POWER. CENTRALLY LOCATED TO COFFEEHOUSES, DOG PARKS, CHKD, EVMS, SENTARA HEART PAVILION, CULTURAL AFFAIRS, COLLEY AVE & GRANBY ST. RESTAURANTS. ENJOY COMMUNITY CLUBHOUSE, TENNIS COURTS, POOL, CHILDREN'S PLAYGROUND. Send me more information about the listing at 901 Botetourt, Norfolk, VA 23507, MLS# 10240021. This 4 bedroom, 3 bathroom home located at 901 Botetourt, Norfolk, VA 23507 has approximately 2,952 square feet. It is currently listed for 549000.00 and has a price per sqft of $18,598. This home is currently Active under the MLS#: 10240021. It is listed by BHHS Towne Realty. 901 Botetourt, Norfolk was built in 1978. It has Garage Att 2 Car, Street parking. The kitchen includes Dishwasher, Disposal, Dryer, Gas Range, Refrigerator, Washer. 901 Botetourt is part of the Ghent Square neighborhood located in 23507.